"With production across our entire Honda and Acura lineups in alignment to meet true consumer demand, we continue to achieve steady and sustainable results as we enter the final two months of the year" said Henio Arcangeli Jr., senior vice president of the American Honda Automobile Division. The Honda brand enjoyed its 4th best October sales month of all time as trucks again led Honda sales gains, while cars were quietly stealing the show as electrified vehicle sales defied gravity and Accord continued to gain momentum. Pilot set a new October mark, gaining 31.1% on sales of 13,479. 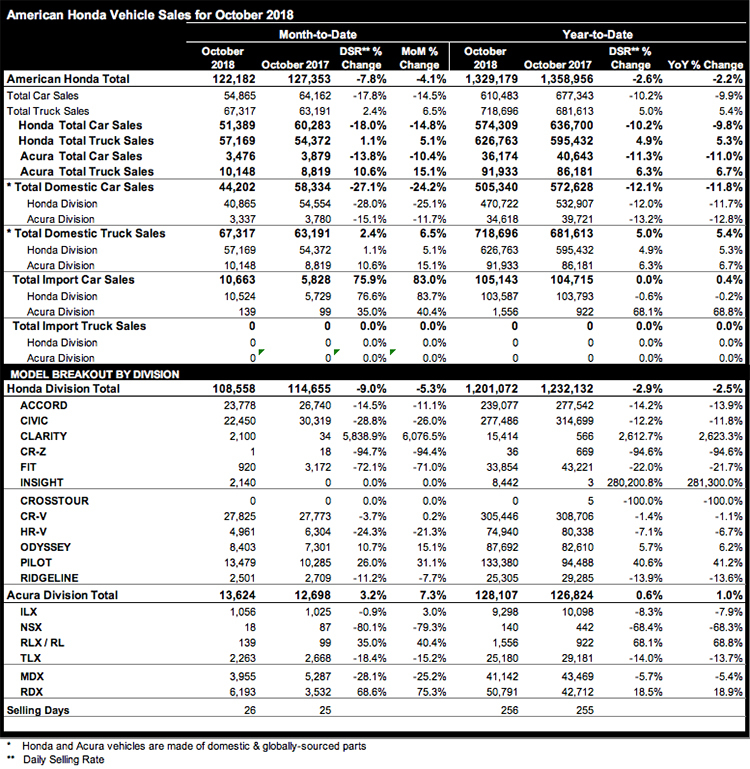 Odyssey sales rose 15.1% on sales of 8,403. CR-V sales totaled 27,825 for a gain of 0.2%. Electrified vehicle sales totaled 6,315 in October, setting a second consecutive best-ever monthly record while recording a 4th consecutive month of sales over 5,000 units. Civic is on track to be America’s #1 retail car for the third straight year, far ahead of the competition and earning more Millennial buyers than any other car in America. Odyssey is the #1 retail-selling minivan in America in 2018, demonstrated in part by having the highest average transaction price in the segment. The Acura RDX nearly eclipsed its best-ever month (June 2018) as it continues to bring the heat to one of the industry’s hottest segments, helping the brand to a 7.3% gain and trucks to a new record in October. RDX sales leaped 75.3%, posting total sales of 6,193 for a best October and second best month ever. Acura trucks set a new October sales record, rising 15.1% on sales of 10,148 vehicles. Sales of the gateway model ILX topped 1,000 units for a 3% gain just as the redesigned and lower-priced 2019 model has begun arriving in Acura showrooms. Led by the all-new 2019 RDX and MDX A-Spec, Acura is on-track to have the brand’s best SUV sales year ever. Acura is one of only two top-5 luxury brands with an increase in retail sales through the end of September.